Displaying data in a tabular format is a task you are likely to perform regularly. The C# DataGridView control is highly configurable and extensible, and it provides many properties, methods, and events to customize its display and behavior. In C# you can display DataGridView in Bound mode, unbound mode and Virtual mode . Bound mode is suitable for managing data using automatic interaction with the data store. 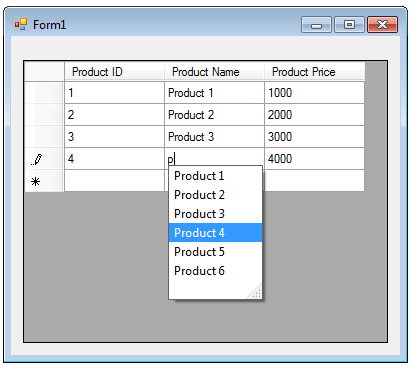 The common use of the DataGridView control is binding to a table in a database. The data can be displayed in the DatagridView using TextBox, ComboBox,	CheckBox etc. While you display the data on TextBox, you can make your TextBoxes as Autocomplete TextBox. The TextBox properties like AutoCompleteCustomSource, AutoCompleteMode and AutoCompleteSource to perform automatically completes user input strings by comparing the prefix letters being entered to the prefixes of all strings in a data source. The following C# program shows how to create an AutoComplete Textbox inside a DataGridView.